There have been plenty of good animated movies, but Pixar has owned the high ground of tugging at the heart strings without being too sappy. KUBO AND THE TWO STRINGS is the latest from Laika, the studio that produced CORALINE. Pixar better keep an eye on their rear view mirror because Laika is coming fast. Kubo is a young boy who is rescued from his evil grandfather by his magical mother. In the process, his mother suffers a severe brain injury that leaves her at times catatonic and at others fully present. Kubo goes to the nearby village to tell stories using his magical shamisen (three stringed guitar-like instrument). He makes paper dance and form origami characters to help tell the story. But the story is not just fanciful. It becomes apparent that it is his story. His grandfather took one of Kubo’s eyes and wants the other one. Kubo stays out after dark one day, something he is not supposed to do because that is the only time his grandfather and his mother evil sisters can find him. The sisters find him and try to capture him. His mother uses the last of her magic to allow Kubo to escape. That is where the adventure begins. Kubo, a monkey and a beetle-man must find a magical suit of armor which is the only thing that can save him from his grandfather. They travel through snow, across a lake and desert to find all the pieces. This is 3D stop motion animation and it is absolutely beautiful. I couldn’t even tell. I thought it was hand drawn until in the closing credits you see the artists creating one of the creatures Kubo has to fight. The scenes are spectacular and the facial expressions of Kubo and Monkey are nearly human. The film stars the voice talent of Charlize Theron, Matthew McConaughey, Ralph Fiennes, Rooney Mara, George Takei and Art Parkinson as Kubo. They all do a fine job. McConaughey is able to tone down his McConaughey-ness just enough to be effective as Beetle. Who is Art Parkinson? He’s the 14-year-old who played Rickon Stark in Game of Thrones. The story is about family and knowing your story and living your destiny. It is powerfully told but does not bludgeon you over the head. Major kudos to screenwriters Marc Haimes and Chris Butler. Director Travis Knight brings it all together in a simply spectacular film. The race for Oscar should be between this film and FINDING DORY. This is superior by a lot. It’ is not as sappy as Dory and a far greater technical achievement. The film is appropriate for children. It can be a little scary at times, but not too intense. 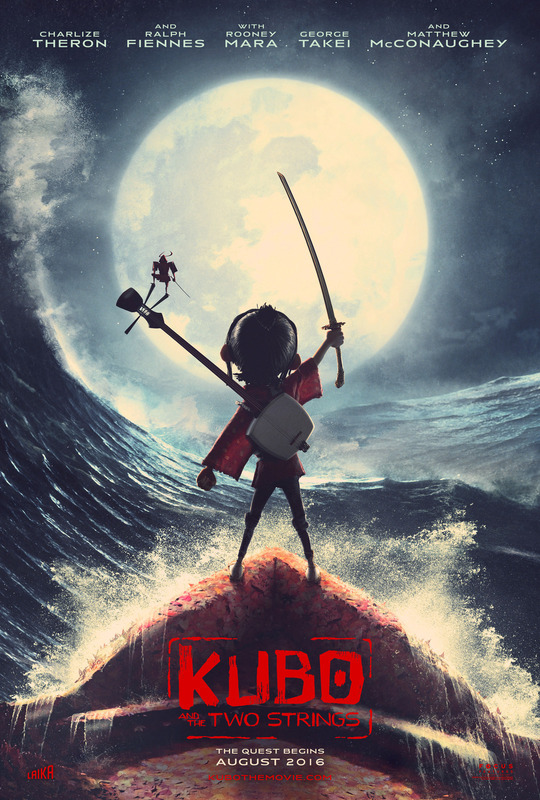 KUBO AND THE TWO STRINGS should be on your must-see list.